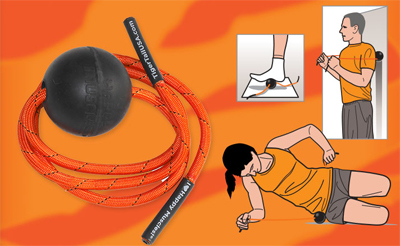 The Tiger Ball (massage-on-a-rope) is designed to reach those knots in the back you can't reach. Perfect for busting out knots in the back, shoulders, legs, and other spots wanting deep pressure relief. To bust out shoulder knots, stand in an open doorway, place the Tiger Ball against the door frame, press your shoulder into the ball. You can also use the ball as illustrated below.